To pay by cheque, send a cheque for the full amount including P&P (made payable to David Ainsworth) to the address at the bottom of the page together with your name, address, and order request. 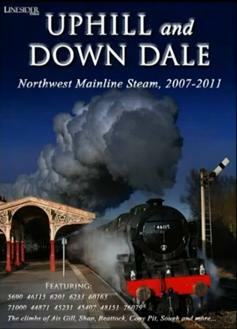 Our pioneer release, highlights Northwest mainline steam (from Beattock to the Peak District) between 2007 and 2011. The 134 minute disc focuses on superb and noteworthy performances from locos and crews, complemented by the stunning landscapes of the region, and, on occasion, the most glorious weather conditions. We start appropriately with 46115's unveiling at the Carnforth Open Day in 2008, before highlighting its first mainline runs in 30 years, including stunning winter scenes on the Settle & Carlisle and Little North Western, as well as breaking runs over Shap. The achievements of the A1 Steam Locomotive Trust go without saying. We see the landmark loco on the rarely used northern section of the Cumbrian Coast, Newcastle-Carlisle line, S&C, and her first ever north and southbound climbs of Beattock. We see the Duchess in fine form in the last few years of her first mainline ticket in preservation, over Shap, Beattock and Ais Gill. Popular and reliable Lizzy is captured in full cry on the S&C, Shap, and Beattock. We see the Duke on rarely used lines around the Cumbrian Coast, and blitzing Beattock. We see Leander on the S&C - in not-so-high summer, and sparkling winter sun and snow. The Black 5 is seen hauling no fewer than 12 coaches over the Long Drag. Ian Riley's Black 5 is seen hard at work on a variety of Cotton Mill Express runs over Copy Pit, Sough, and Giggleswick Bank. The superb pairing of a '5' and '5x' for the first time in many years are shown in all their winter glory. The Stanier Stalwart is shown on the now under-threat (for steam) Cumbrian Coast route, and blitzing Ais Gill. The Standard 4 may never see work on the region's mainlines again; we look back at her runs over Copy Pit and Sough.